So today I decided to stick with an animal related post. I mean.. why not right.. everyone loves a good animal tale! & I can guarantee this one is nothing less then entertaining! When T & I moved on our new place last year I was begging him for a puppy… he said no because we are not home enough.. & I agreed. I then asked “Well can we get a pig instead…?” To my surprise he said “Ya sure..” YIPEEE!!! I called up a good buddy of ours to see if he could help hook us up with a pig.. after a few weeks of not hearing anything, I didn’t think we would be getting one… Then here comes our buddy driving along the road.. with a baby pig in his truck! Didn’t take us long & we had Clark a comfy cozy bed all made up! We just had also adopted two kittens from our neighbors farm (Harry & Lloyd). As you can see in the picture we had a barn full of babies. We weren’t sure how well cats & pigs got along, but after one day of getting used to each other they were literally inseparable! I would go in to feed & water them every morning before work & find the cats snuggled right up with Clark in his little Pig House. Then the adventures began!! When we first let Clark roam free, we would make sure we were out in the yard. He would only go where Harry & Lloyd went. He would run across the grass… then tip toe tip toe across the gravel. 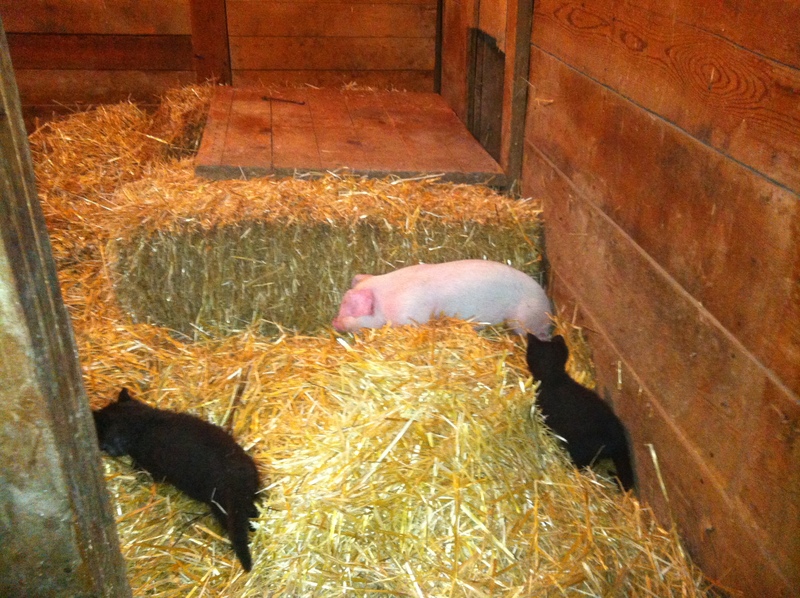 I was worried as I had never trained a pig before, on how to get him back in the barn at night. So I would call his name “Here Clarrrrkkkk…” & you guessed it nothing… Hmmmm well I may as well call the cats “Here kitty kitty kitty….” Then here come Harry & Llyod ripping across the yard… with their best bud Clark hot on their heels! Perfect I thought! 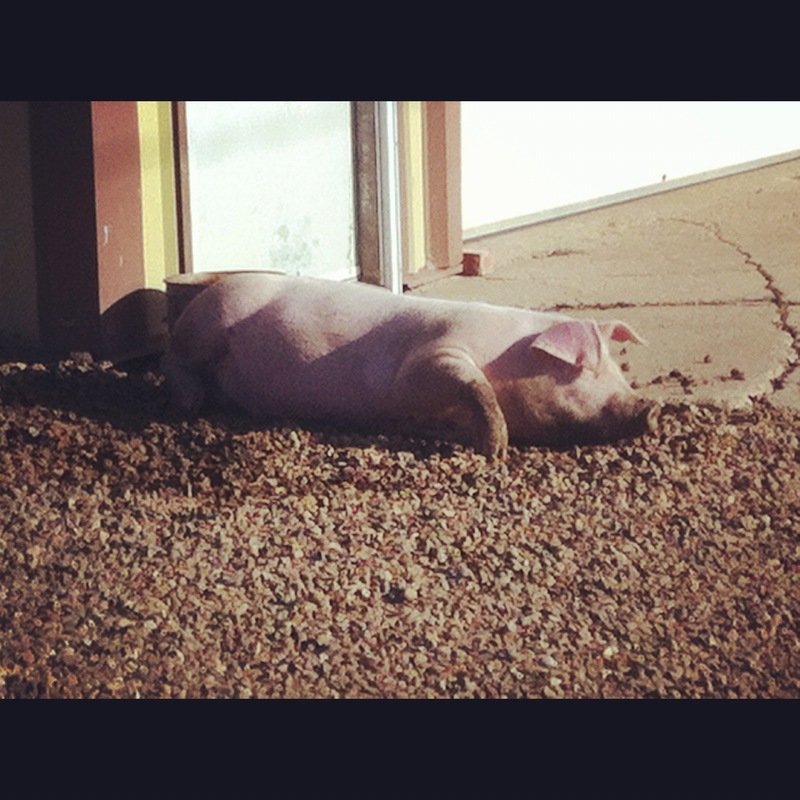 So from then on I am sure our pig thought he was a cat… I would just call “Kitty… Kitty” every time I was looking for him & without hesitation he would come a running! He even would get into the cat food bag if we didnt have it up high! As he got braver him & the cats would explore down to our dug out… & in the field from time to time that bordered our place. I even started catching him in the ditch once in awhile.. but the best part was he knew my truck.. When he would see me coming down the road.. I would see a flash of pink just a boogieing back to the yard with cats trailing behind! Who knew a pig was just like a dog if not smarter!!! He was AWESOME! Once Harvest came along, T & I would be at work all day… then hit the field for the night. With this Clark & the cats didn’t know what was going on as they would be left all day on their own. Then the call came..”Hi, we are your new neighbors down the road… just thought you should know that while we were painting our garage a big pig & two black cats walked right in.. are they yours?” AWWWWW MAN!!! He traveled to the neighbors! Before we got there he & the cats luckily came back home on their own. But after that we had to keep a close eye on them. 2) They root a lot! Luckily for us we have a pile of carriganna’s around the farm so he would just live in them, and root and root and root. Which was good cause he left my garden alone! 6) They dont care to be picked up… but they love to be scratched!! 7) They love to play! Clark would play with the sprinkler all day long… If you chased him and then turned around he would chase you back.. He was like a puppy! 8) They love to nap in the sun! Unfortunately we no longer have Clark, which is sad… But I must say we had a blast with him! I would recommend it to anyone., as they are pretty low maintenance.. especially if you have corrals & a barn! Or just let them be free range like we did Clark. I could tell more stories about this adventurous farm animal… & now too many I am known as the Pig Girl (great name eh…not haha).. Everyone loved him!! I love your blog Amy!! 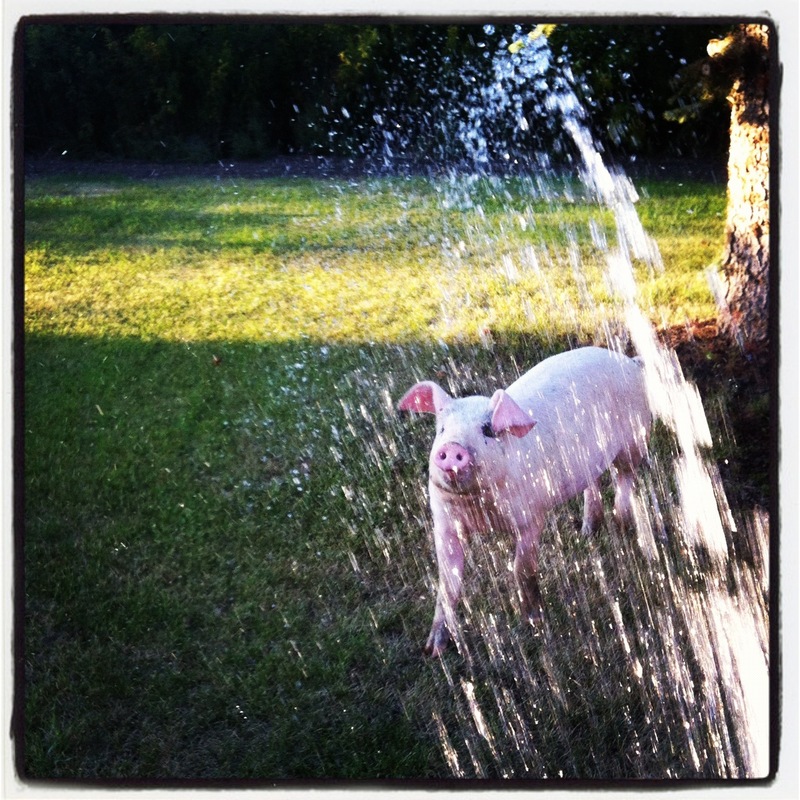 I had a pot belly pig as a pet when I was little, my Dad bought him for me….without my Mom’s knowledge. He actually lived in house with us while he was young., sleeping in our linen closet. He wandered a good 5km from our house and was brought back by our neighbours 🙂 He also ate a tube of grease uknowingly to my Mom – and he shat it out everywhere leading her to panick thinking he was hemmerhaging!! Haha. Keep up the awesome blog! Great story Amy!! I loved reading it even though I have heard it before! Will the Easter Bunny be next?